Americans treasure Oprah and Jimmy Fallon, and the British can’t get enough of Graham Norton. Who are the beloved talk show hosts for native French speakers? From late-night talk shows that host the hottest new celebrities to morning shows that discuss the best movies out there, there’s a French talk show for every taste. Though many have been running for years without any sign of being cancelled, there’s a variety of talk shows that used to be popular but no longer run—such as “Apostrophes,” the famous French television show that arguably started the craze. Why Learn French with Talk Shows? It’s always great to maintain variety as you continue to learn French. TV Shows, radio, music, books and magazines are only some of the many options you have in your pursuit to to read, understand and speak French. What’s great about television talk shows in particular is that they combine a couple different media at once—you’ve basically got a radio talk show, where hosts take a general theme and create different shows every week that center around that theme, combined with a TV show that has characters and a plot, where viewers get to watch the characters speak (which makes comprehension much easier since you’re able to see the mouths and faces of the speakers). You could even argue that television talk shows also have elements of your typical newspaper, since many of them are news-centric. 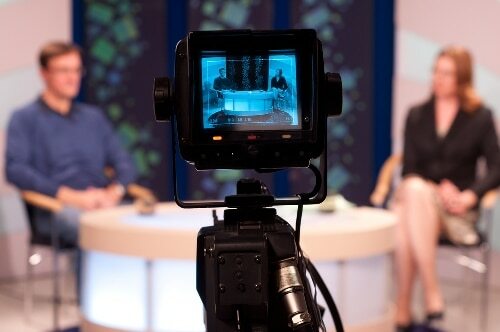 Here are some more reasons why you should add talk shows to your daily schedule. As I just mentioned, many French talk shows will center around the news—often with a humorous spin. Just as the United States boasts talk shows like “Wait Wait…Don’t Tell Me!”, the radio news quiz, and humorous, late-night TV news shows like “The Daily Show,” the French have their own shows like “On a tout essayé,” the humorous news-oriented talk show that ran for seven years before ending in 2007, and “Tout le monde en parle,” a similarly structured show that ran for eight years and ended in 2006. Watching a French news talk show—humorous or not—is a great way to keep up with current events (and to hear what some native French speakers think about them). Just as reading a French novel or watching a French movie will help you get acquainted with French culture, watching a talk show will allow you a more intimate and straightforward opportunity to observe French in action. After all, you’re listening to French speakers discuss everything under the sun, from arts and entertainment to politics and current events. Plus, you’re hearing (with no filter) what they think about them. You’ll hear the most silly and raucous jokes about them. This could be one of the best ways to immerse yourself in language and culture, besides directly making French friends. Whether you’re just beginning to acquaint yourself with casual French conversation or you’re trying to master the little subtleties, it’s always a good idea to practice watching the natives have a normal conversation. Take notes as you go and ask your French friends later about phrases you don’t understand or little words you can’t identify. The more you watch and listen closely, the more you’ll adopt into your own vocabulary and casual conversation skills. With all the options out there, where do you begin? And how do you get access to this great resource outside of France? Keep in mind that you’ll need a VPN (virtual private network) to watch any programming on the channels France 2 and Direct 8, unless you have the fortune to currently be living in France. For those of us stuck outside the borders of France, a safe and reliable VPN service is a real godsend. Essentially, a VPN makes it appear as if you’re using the internet in France rather than the United States (or wherever you are). An easy way to set up a VPN and magically change your location to France is by installing HideMyAss! VPN on any of your devices—it works on your computer, smartphone and internet-enabled TVs and game systems. Arguably the most popular French talk show around, “On n’est pas couché” is a two-and-a-half-hour marathon hosted by talk show king Laurent Ruquier. Every Saturday at 11 p.m., a group of invited guests spends the entire show discussing something that happened within the past week—and the debate makes for an interesting evening discussing what’s happening in France and in the world at large. Where to watch it: France 2 posts the most recent episode on its website, in addition to various clips and videos. You can also watch quite a bit of the show on its official YouTube channel. Known for its red couch where guests sit, “Vivement dimanche” invites celebrities to discuss their most recent endeavors in addition to their backgrounds and rise to fame. This talk show is a lot of fun because you get to know some of your favorite celebrities while keeping abreast of the best new art and entertainment projects. Where to watch it: The France 2 website posts clips and full episodes on their website and the host, Michel Drucker, posts full episodes on his blog. Searching YouTube for the show’s title reveals a large collection (from various YouTubers) of full episodes and clips. This daily news show, hosted by Cyril Hanouna, broadcasts every day on Direct 8 (D8) at 6:45 p.m. The moderators, along with two or three celebrity guests, discuss the most shocking and surprising news and photos from the day. The guests spend time discussing their own lives as well—and usually end up getting teased by the moderators! Where to watch it: Direct 8 posts clips and full episodes on their website. You can also find full episodes on YouTube by running a search for the title. Frédéric Taddeï hosts this cultural news talk show every Friday at 11:30 p.m. on France 2. Guests include people from the art world—anyone from actors to writers to comedians to artists. In addition to the interview, the hosts and the guest conduct debates about current cultural events and phenomenons. There’s even a musical guest each episode, so you get a taste of new and popular French artists as well. Where to watch it: France 2 posts clips and full episodes on their website. Tons of full episodes and more are regularly uploaded on the show’s official YouTube channel and on Dailymotion. 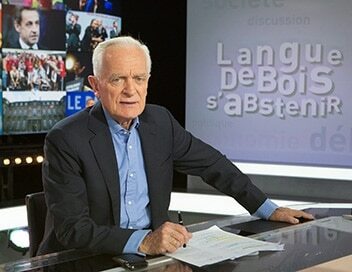 This political show is hosted by Philippe Labro and shows on Direct 8 at 12:20 a.m. and is split into three major segments during its 52-minute run: Les mots de la semaine (literally, words of the week), where the moderators discuss the most shocking quotes of the week, Le débat de la semaine (the debate of the week), where moderators debate about a certain news event, and La polémique de la semaine (the controversy of the week), where a major controversy is discussed and debated. Where to watch it: Full episodes are posted on the Direct 8 website. As you can see, whether you love news or cultural events or entertainment, there’s a French talk show suited to your interests. Go find your show—and enjoy!